With beautiful turned legs and an elegant two tone weathered oak finish, this traditional style end table is the perfect piece to complete your living room with. The chairside table features a single drawer with a beautiful drop pull handle wile the tabletop provides ample space to rest a lamp and a good book. The Bordeaux Traditional End Table with Drawer by Wynwood, A Flexsteel Company at Conlin's Furniture in the Montana, North Dakota, South Dakota, Minnesota, and Wyoming area. Product availability may vary. Contact us for the most current availability on this product. 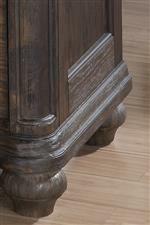 The Bordeaux collection is a great option if you are looking for Traditional furniture in the Montana, North Dakota, South Dakota, Minnesota, and Wyoming area. Browse other items in the Bordeaux collection from Conlin's Furniture in the Montana, North Dakota, South Dakota, Minnesota, and Wyoming area.